I’ve taken to making wallpapers again. Jeremy was very generous to me this Christmas and bought me a Macbook Pro! It’s changing the way I choose to do web development and greatly increased my photography editing productivity. In any case, I’m spending a lot more time on it at home now than before and make wallpapers for it now and then. I’m heavily motivated by ideas and methods that push for success and getting what you want using practical longer term methods. 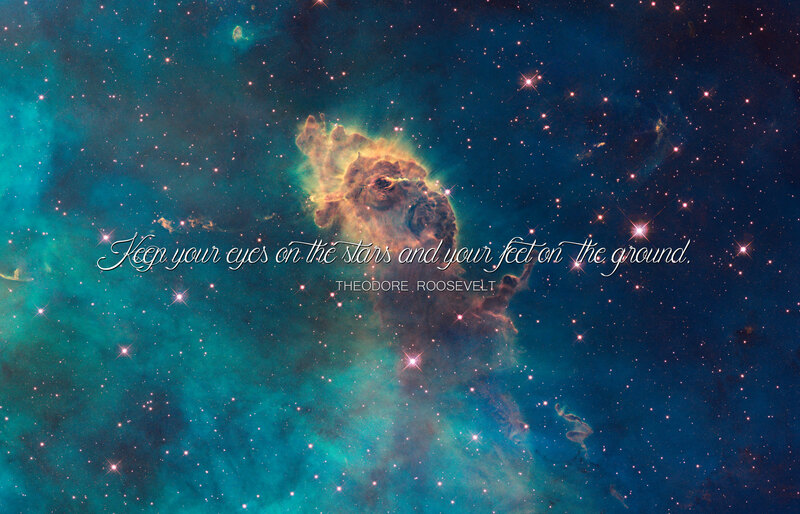 Theodore Roosevelt’s quote has always spoken to me. Also today we had a space pun thread on Facebook so I’ve had space images and vocabulary running through my head all day. Voila, new wallpaper! Download the Full Resolution File at 2800 x 1800. Source image is Full-field image of a stellar jet in the Carina Nebula, imaged by Hubble’s WFC3/UVIS detector. Did you know that all images produced by NASA and published on APOD are public domain? Pretty neat.